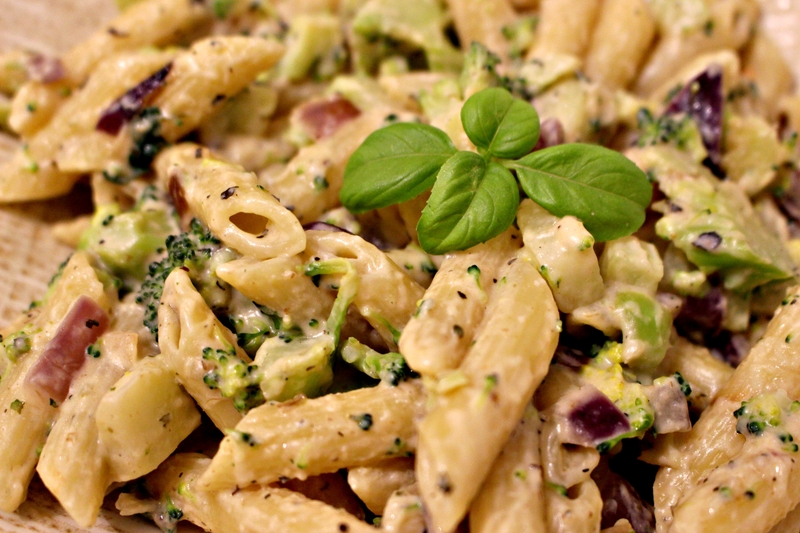 Broccoli pasta in a thick and creamy cheese sauce! This one is inspired by my dads recipe! Growing up, one of my favourites was his cheese and broccoli pasta and up until now I’ve really missed it. It was about time I’d veganised it! I swapped milk for almond milk (simples), and the egg for nutritional yeast, which worked well to thicken the sauce as well as adding a cheesy flavour. I also added an amaaazing creamy cheese I stumbled across! After being at my job for nearly 2 years, only now have I discovered a Wholefoods Store just 10 minutes walk from the office!! I was in vegan heaven when I found it, and stumbled across so many ingredients I can’t wait to use! One of which was a creamy garlic cheese, similar to Philadelphia’s spread I used to have! 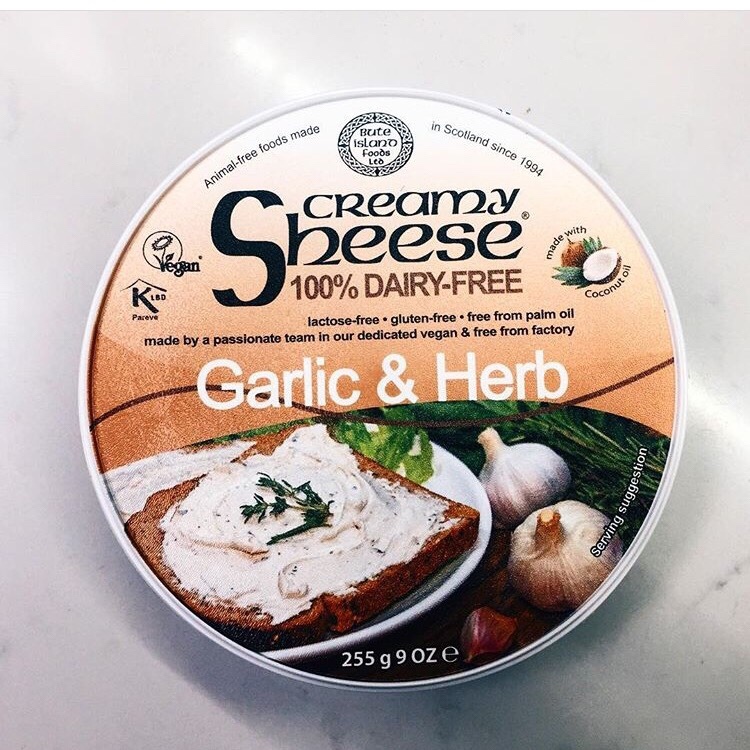 Creamy Sheese, Garlic & Herb. Up until today, I’ve just had it on crackers, but I was excited to use it in a recipe. 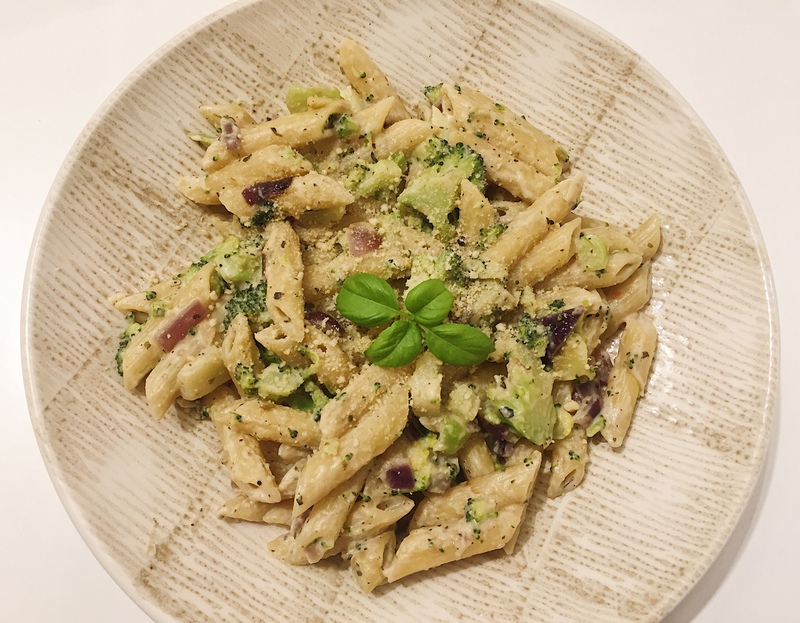 It works PERFECTLY in pasta as it’s so smooth, creamy and flavoursome! It’s coconut based, palm oil free, gluten free and lactose free! Put the pasta on to boil, check the packet for timings as these can vary. Pop the half broccoli on top of the pasta for 5 minutes until it softens a little. Fry the onion and garlic in olive oil until softened. Chop the broccoli and add it to the pan along with the crumbled stock cube and basil, fry for 5 minutes. Once the pasta has cooked, drain the water and add to the pan. Add the cream cheese, nutritional yeast and plant milk and fry it all together on a medium heat for 5-8 minutes until the cream cheese melts into the pasta. Serve with some fresh basil, and top it off with some vegan cheese if you wish. Thanks 🙂 super easy to make too!